Fire Joker online slot game single-handedly shows us that there's plenty of life left in the classic fruit machine games. Designed by Play’n GO, it offers the traditional 3 reels with 5 paylines, but with the modern twist of bonus games alongside it. 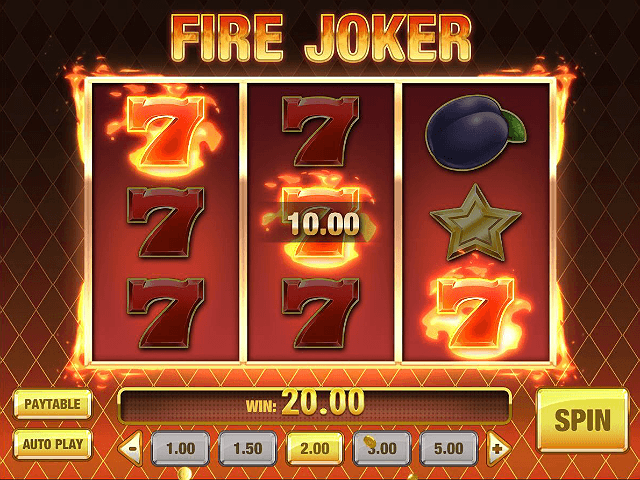 Read through this Fire Joker slot review to see why you should try these classic games. Play Fire Joker Slot Demo for Free! Play Fire Joker for Real Money! 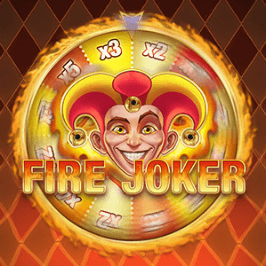 The Fire Joker online slot is a homage to the classic fruit machines that still thrive in many brick and mortar casinos to this day. Software provider Play’n GO has given the board a glossy makeover, with the three reels rotating in a luxurious gold frame. Likewise, the flashy soundtrack has reworked the classic sound effects of fruit machines into a euphoric stream of synth music. The key to Fire Joker’s fun is its simple yet highly engrossing gameplay, especially when the reels are set alight with the flames of fortune. Although there are only five fixed paylines, Fire Joker offers a red hot return-to-player (RTP) rate of 96.15%, making it one to save under the favourites tab. 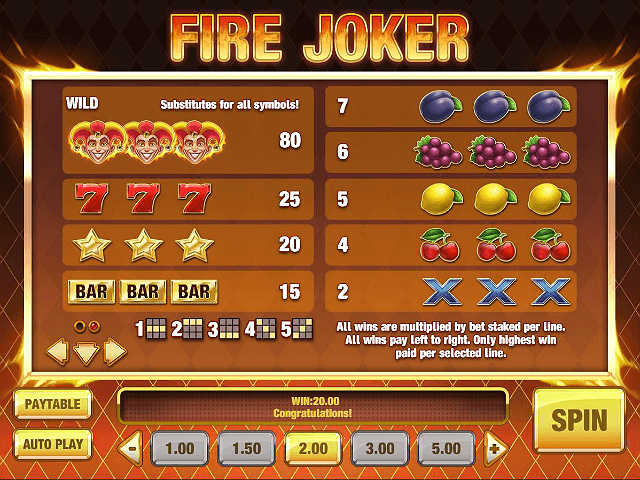 As it harks back to the good old days of fruit machines and one-armed bandits, Fire Joker features an array of recognisable symbols that define early slot games. Fruit such as cherries, lemons, grapes, and plums can be plucked from the paylines. You'll also find the classic ‘X’ icon, as well as high paying symbols like the gold bar, golden stars, and lucky number 7s. The Fire Joker logo doubles as the Wild, and can be substituted for all other icons. It is also the top paying icon, offering 80 times the initial wager for a winning row of three. All the wins pay left to right only, and if multiple paylines are struck, only the top one pays out. You'll immediately know when you've hit a payline: the board will be set on fire as a guitar strums out a celebratory chords. Bets on Fire Joker online slot can be as little as 0.05, or as high as 100 if you feel like you are on fire. There is also a handy auto play feature that can be set to run from between 10 to 50 spins. It can also be programmed to stop if there is a win or a bonus game. It can also be paused should your balance shoot above a certain value, or fall below one, or if you are fortunate to strike a hefty win above a specific amount. 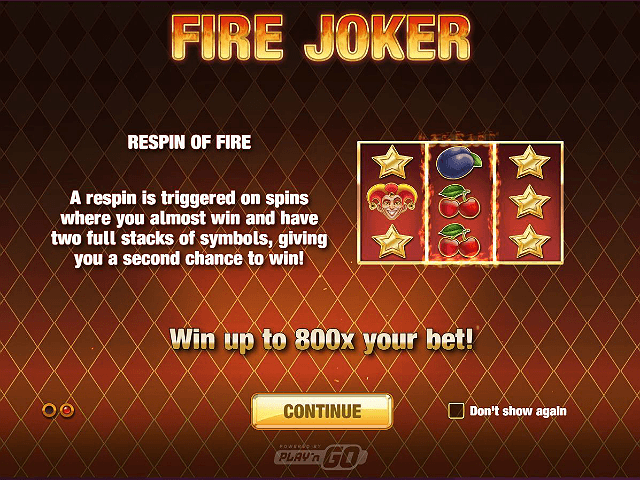 The Fire Joker slot game features two bonuses. The first is dubbed the Respin of Fire, and comes into play if you hold the same symbols on two reels. If there is still no winning payline, the third reel without the matching symbol catches fire as it spins again. The second special feature is the Wheel of Multipliers. It is activated when each reel contains stacked symbols. A fiery wheel appears, split into segments that each contain a multiplier award amount, ranging from x2 to x10 the bet. 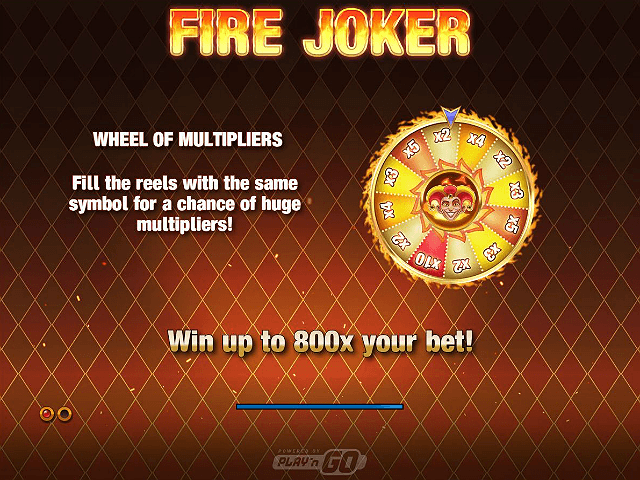 The wheel spins automatically, with the Fire Joker’s face a static centre point as you see which bonus you have won. Combining this with the Wild winning combination could offer a potential win of up to 800 times the bet. Share this Fire Joker Review today! If you like Fire Joker, you'll love these slot titles too!